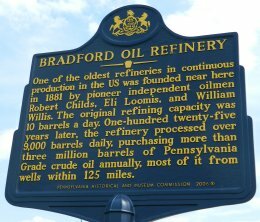 American Refining Group (ARG) is a unique facility situated on approximately 131 acres on 77 North Kendall Avenue in Bradford, Pennsylvania – the heart of McKean County and the birthplace of the U.S. domestic oil industry more than 100 years ago. The refinery has a rated capacity of 11,000 barrels per day and processes light sweet paraffinic crude. This type of crude is available domestically, and ARG purchases the majority of its crude from sources in Pennsylvania, Ohio, New York and West Virginia. ARG stocks are converted into high-quality waxes, lubricant base oils, gasoline and fuels, as well as a wide variety of specialty products. American Refining Group’s state-of-the-art blending and packaging facilities are capable of producing a full spectrum of finished lubricant products. These products are available in a broad range of package sizes, including bulk, and can be delivered either by rail or truck. Their total commitment to quality is proven through their packaging plant and refinery being both ISO 9001:2008 and Made in USA certified.